Wayne Thiebaud was born in Mesa, Arizona, in 1920, but spent most of his youth in southern California. He admired cartoons and comic strips from a young age and began his career as a commercial artist in his teens. He worked as a sign painter and apprenticed as an animator for The Walt Disney Studios before serving in the United States Army Air Force during World War II. 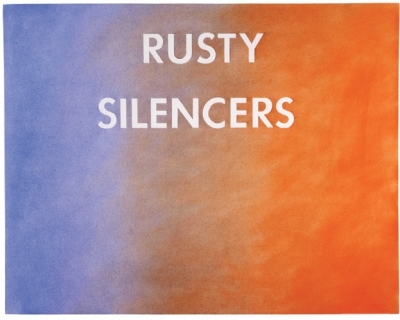 After his service, he continued to work as a commercial artist—designing movie posters, making cartoons, and working in advertising— before pursuing the study of fine art in the late 1940s. Studying under the G.I. Bill, Thiebaud earned his bachelor’s and master’s degree from the California State University in Sacramento. While still in graduate school he began his teaching career, working as an art professor for eight years at Sacramento Junior College before joining the faculty of the University of California Davis. Thiebaud has enjoyed a long and distinguished career as a teacher, and although he retired at age seventy, he continues to give popular classes today as professor emeritus. Apart from a sabbatical year spent in New York in the late 1950s, Thiebaud has lived and worked in California for his entire career. By the early 1960s, Thiebaud had begun painting the works for which he is best-known, depicting everyday consumer objects in bright colors, such as cakes, pies, hot dogs, candies, gumball machines, toys, and pieces of clothing as they are seen in store windows. Drawing from nostalgic recollections of bakeries and diners from his youth, Thiebaud often painted these objects from memory rather than from direct observation. In order to heighten their chromatic intensity, he outlines his forms in radiant, rainbow colors that create a halo-like effect. Working with thick, creamy paint, Thiebaud often spotlights his objects against pale backgrounds with the well-defined shadows characteristic of advertisements. In addition to his still lifes, Thiebaud also frequently paints portraits in the same style, depicting sober-faced figures set against light, empty backgrounds. show of 1962, “New Painting of Common Objects,” at the Pasadena Art Museum, that helped establish the movement—Thiebaud never embraced the concept of Pop art and preferred to describe himself as a traditional painter of illusionistic forms. Disregarding the art trends and movements over the past fifty years, Thiebaud has instead pursued his distinct vision of exacting craftsmanship and meticulously rendered forms that owe more to the masters of the still life tradition than to his contemporaries. After settling in San Francisco in the early 1970s, Thiebaud began a series of landscapes and cityscapes, painting the steep hills and vertiginous inclines of the city in colorful, dramatic canvases. With his characteristic vibrant palette and meticulous painterly technique, he represented dizzying, unexpected views of San Francisco’s streets and buildings. In the late 1990s he began a series of landscapes of the Sacramento River Delta, painting the watery landscape and surrounding fields in pools of unexpected, vibrant hues. Rejecting traditional perspective, he largely disregarded the sky or horizon line in favor of flat, aerial views. Most recently, Thiebaud has painted a series of mountains, depicting unusual close-up and cross section views of fantastic, towering summits with luminous colors and rich textures. Alongside these landscapes and cityscapes, Thiebaud has continued to paint his signature still lifes of consumer goods. Experimenting with color, texture, light, and composition, he has repeatedly tackled the same subjects to challenge and explore the formal possibilities of painting. 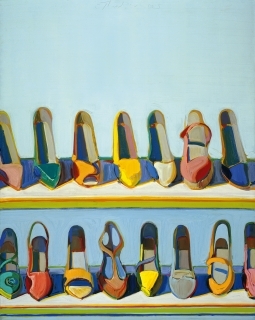 In October-November 2012, Acquavella Galleries held its first exhibition of works by Thiebaud, a retrospective of paintings and works on paper from the mid-1950s to 2012. Photo by Matthew Bult, 1990.